QEP is delighted to have won Power Tool Product of The Year Award with Plasplugs Pro Tiler XL Electric Cutter and Hand Tool Product of The Year Award with Plasplugs Powerglide manual tile cutter. 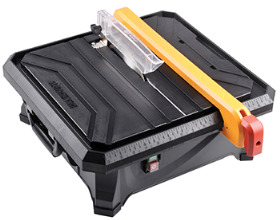 Plasplugs Pro Tiler XL electric tile cutter (DWW550) cuts any size tile up to 30mm thick. The quick release fence aids straight cuts, with shaped cuts and 22.5d egree and 45degree mitres also achievable for sockets and corner finishing. The Hi-Torque motor prevents stalling and water recirculation system enables cleaner “no-mess” cutting. An integral carry handle aids quick and easy transportation. Plasplugs Powerglide manual tile cutter (PGL600) cuts quarry, porcelain, terracotta, ceramic and tiles up to 12mm thick and 425mm by 600mm with a precision tungsten carbide cutting wheel. Roller bearing technology provides smooth scoring action and the integral carry case enables quick and easy portability between tiling locations, along with a level surface for cutting large format tiles.